Sew New: If I carry on this way, I'm in serious danger of becoming a one trick pony! If I carry on this way, I'm in serious danger of becoming a one trick pony! I've done it again, it's another Peplum! It's also not the first of the week as I have another on the way!!! If I'm not careful I certainly will end up a one trick pony. But I so lurrrrve the Peplum. I have such a boy figure that it helps me fake a shape and it also hides my tummy a little, so it just perfect for me. 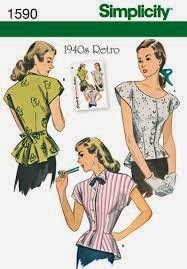 I've been lusting over this pattern for a while now, it's Simplicity 1590, which is a vintage Peplum blouse. Simplicity are currently selling their patterns at half price, so this was the ideal time for me to get my hands on it. Call me a cheapskate, but I hate paying full price for patterns these days, unless they are really special. Unfortunately I managed to mess up a little on the measurements whilst I was making this blouse as I have made it a tiny bit snug around the waist. (D'oh) There's not much ease left so you can see it pulling a little. Yup, that's what you make toiles for! But that's not really much of a concern for me as I'd made it out of some cheap broderie anglais that I bought from Boyes, so even if I hadn't ever worn it ever again it wouldn't have been so much of a loss. A close up, as you can't see the detail in the photos. I was thinking this morning as I put it on that I hated it. I thought this will be the first and last time I ever wear it ever. But looking at the pictures, maybe it's not so bad after all? In fact maybe it's even a little bit cute? All in all it took 5 hours to make, I couldn't believe how quickly it came together. OK, so 5 hours isn't so speedy, but I like to take my time! This is definitely a blouse that I will make again, but next time a few adjustments need to be made. This time I traced a 10 and graded out to a 12 at the waist, but next time I think I will trace a 10 and grade down to half way between a 12 and a 14 at the waist. I can see it in all kinds of fabrics, but mostly I have my eye on Moda's 'April showers' collection for the next one!